Philip Rivers Is Pumped, But How The Hell Did The Chargers Win? What? Huh? San Diego, a team that eked its way into the playoffs in the final weeks, will take on the Broncos for the third time this season after beating the Bengals 27-10. 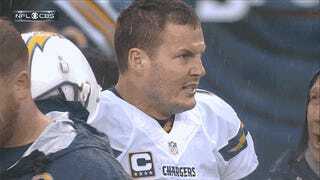 Philip Rivers must have also talked to Ric Flair before his game. The Bengals defense did a hell of a job for most of the game. On two drives, the Chargers got to the Bengals' one-yard line and six-yard line. Both times, Mike Zimmer's defense held up and made San Diego settle for field goals. The damage was minimized well enough to keep it close for Andy Dalton and his crew, right? Nah. Cincinnati's offense had many chances, and yet, they ended with 10 points. The turnovers were killer. Giovani Bernard fumbled in the red zone. Dalton lost the ball, untouched, while falling down on a run, and he also threw two interceptions. These embarrassing fuckups came against one of the worst defenses in the league and totally derailed things. The nadir for the discombobulated offense came on a Bengals fourth-and-3, one of the offense's last chances. Down 10 points late in the game, the right call was to go for it, but the play called was a deep pass to Marvin Jones. There was no chance, and it was so ugly. But congratulations to San Diego for pulling off the upset. Now, the Chargers will take on the Broncos for the third time this season. Peyton Manning's touchdown factory will try to ravage a weak Chargers defense, but San Diego was one of the three teams to beat Denver this season. And Mike McCoy left his job as the Broncos offensive coordinator and quarterbacks coach to take the head coaching gig in San Diego. Should be fun.